Northwestern State University First Lady Jennifer Maggio met and exceeded the goal of collecting 1,884 new and gently used books for children age 5-15 that will be distributed to schools and youth centers in northwest Louisiana. More than 2,000 books were counted at the collection site at Collins Pavilion during tailgating festivities Saturday, supplemented by over 200 books collected at NSU’s Leesville campus last week. 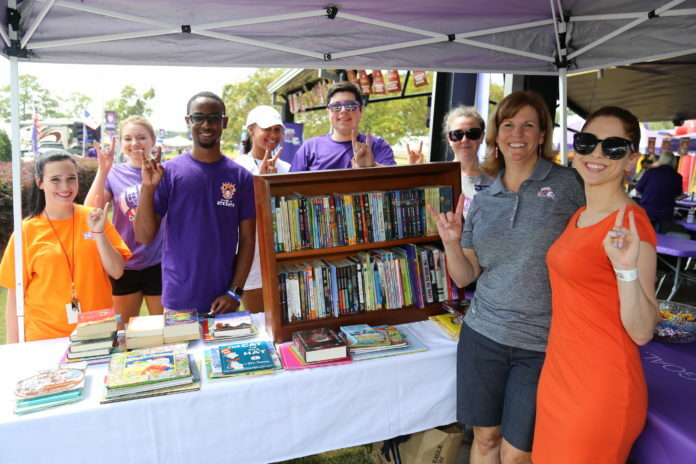 NSU student and staff volunteers helped with the project, Forks Up for Literacy, and plan to continue the initiative by manning a collection site from 2-3 p.m. before every NSU home football game. From left are Blair Gala, Karlee Littleton, Aaran Gafford, Nicole Colley, Seth Gautreaux, Crystal Long, Jennifer Maggio and Melanie Maggio.